The Olympic Mountains are a fantastic set of peaks and offers some of the most diverse climate in the world. It is bordered on the west by the Pacific Ocean, on the north by the Strait of Juan de Fuca, on the east by Hood Canal and to the south by the Chehalis River. On the western slopes of the Olympic Range, some 200 plus inches of precipitation fall annually, while the Eastern slopes average only 20-30 inches. This creates a variety of plant life hardly seen anywhere else in the entire world. 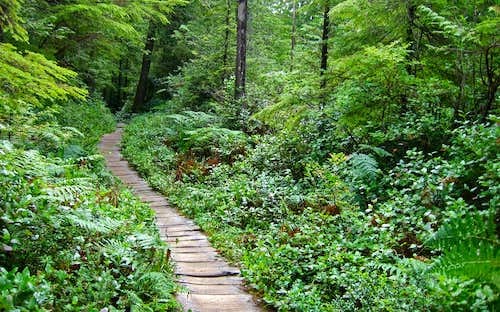 Occupying the center of the peninsula is Olympic National Park and it's 950,000 acres of protected mountain wilderness. Also, surrounding the National Park are 5 wilderness areas known as the Buckhorn (two parts), The Brothers, Mount Skokomish, Wonder Mountain and Colonel Bob wilderness areas. The highest peak is Mount Olympus at 7,995 feet in elevation and is one of the most prominent peaks in WA state, as well as in North America. It's base is barely above sea-level and this mountain is truly an awe inspiring sight when viewed from any point in the range. Being on the western margin of the range, it is flanked by many huge glaciers and offers a very challenging mountaineering trip to reach its summit involving a 25 mile one-way approach and miles og glacier travelling all leading to a loose 4th class rocky summit pitch. Further east, the peaks have a higher average elevation and are rugged and rocky with less glaciers. There are however glaciers in the northern Bailey Range, Mount Anderson Massif, Mt Cameron, McCartney Peak and in the Southwest part of the range on Mt's Delabarre, Queets and Christie. 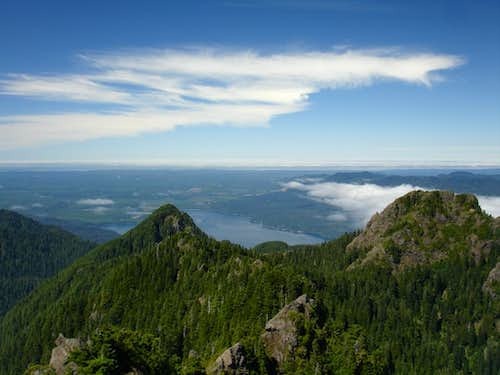 On the eastern flank of the range, Mount Constance and The Brothers are easily seen from the Seattle area and are the only major peaks in the Olympics visible from the east in the Puget Lowlands. The coastline of Washington State is a very long, remote and pristine set of beaches and headlands stretching from Cape Flattery to the north and the mouth of the Columbia River to the south. The coastline also continues east from Cape Flattery along the Strait of Juan de Fuca past Port Angeles and Sequim. 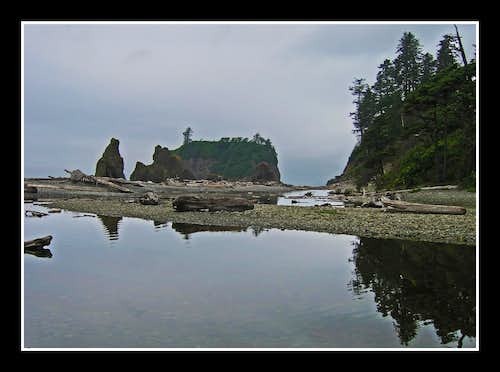 A large portion of the coastline is protected by Olympic National Park. One notable thing about the Washington coast is the extreme lack of non-cloudy days. Us Washingtonians will try to go to these beaches during those rare times the sun is out however the continuous cloudiness actually draws people from around the country who have never lived in a mild temperate zone. The daily highs and lows vary by maybe 5-10 degrees year round and the skies are blanketed by low clouds much of the year. The moderating effect of the pacific ocean doesn't allow for thunderstorms to develop very often in the summer and makes it too mild for snow to fall in all places except the mountains. Unlike the Rockies though, even the mountains are mild. They may get lots of snow due to the abundance of moisture however most of this falls in temperatures between 15-30 degrees. Nighttime lows and winds are also much milder in the Washington mountains. It is this unique climate that draws people from all over the country to the Olympics and the Washington coastline. We are truly gifted to have such a friendly climate even if it does mean endless cloudiness. Getting to the Washington coast can be a real chore for some. This wild coastline is as far west as it gets in the lower 48. Even from Seattle it is a two hour drive. Depending on where you want to go along the coast, your route getting there will vary dramatically. If you are looking to go to the south beaches like Ocean Shores, Long Beach and areas around the mouth of the Columbia River, it is best to go south on I-5 from Seattle past Olympia and then head on one of the many highways that goes west. Some of these include Highway 8 just outside Olympia, Highway 12 from Grand Mound or Highway 6 from Chehalis. If you are looking to go to the North Coast it would be best to take the Edmonds to Kingston Ferry. This ferry connects Highway 104 from the mainland to the peninsula and is about a 25 minute ride. From Kingston continue west on Highway 104 and cross the Hood Canal Bridge. When it connects with Highway 101 continue west past Sequim and Port Angeles until you get to the now famous town of Forks. A number of roads lead out from Forks that will take you to the different places on the North Coast. One of the more popular trips people take on the Olympic Peninsula is to drive the Highway 101 loop and pick places to visit along the way. Descriptions for each place will be based on the assumption that someone is doing this loop in a counter-clockwise direction. This page it to act as an informational source about many of the places along the Washington Coast that are not associated with the Olympic Mountain Range. See this page for information about the mountain range itself. Port Angeles and Sequim make up the metropolitan area for the Olympic Peninsula. This is the gateway to the Olympic Mountains and the Washington coast. Sequim is famous for being perfectly situated in the rain shadow of the Olympic Mountains. They boast only getting a quarter of the rainfall that nearby cities and the Seattle area gets and they often sit in sunshine while other western Washington cities are socked in the rain. Probably the best thing to see near these cities is the Dunganess Spit situated within the Dunganess National Wildlife refuge. 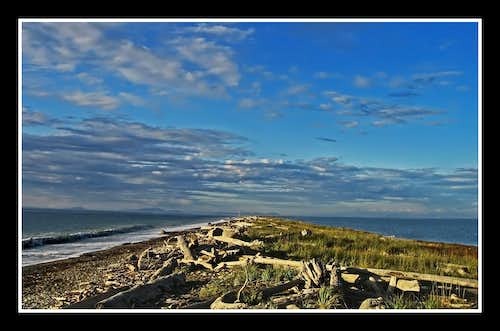 The Dunganess Spit is the longest natural sand spit in the country and extends 5 miles into the Strait of Juan de Fuca. A lighthouse sits at the end of the spit and a long but easy day hike to this lighthouse is very peaceful. Since this is a wildlife refuge, many native animals are around and one should stay out of the closed areas. A nice campground is right next to the start of the spit that will charge I believe $15 per night. Since this is a wildlife refuge they ask for a $5 donation if you plan to hike out onto the spit. Sunsets here are particularly spectacular and one can easily spend an entire day here. This would be a great hike with smaller children. Port Angeles also has a sand spit of its own but it's about half the length. This also makes a good day hike/walk. Port Angeles and Sequim are both large enough cities and have all the things you will need to stock up for a week long trip around the peninsula. 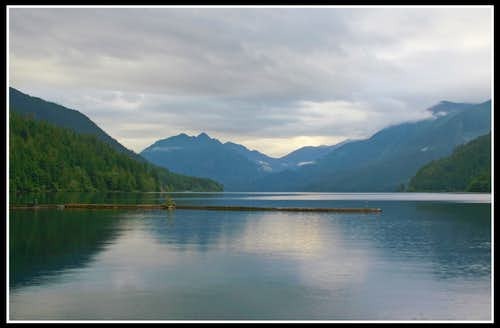 Shortly after leaving Port Angeles on 101 to the west the highway will pass right along the south shore of Lake Crescent for its 8 mile length. This Lake is about 800 feet deep which means the bottom of this lake is below sea level. Many more easy hikes are scattered around the lake. 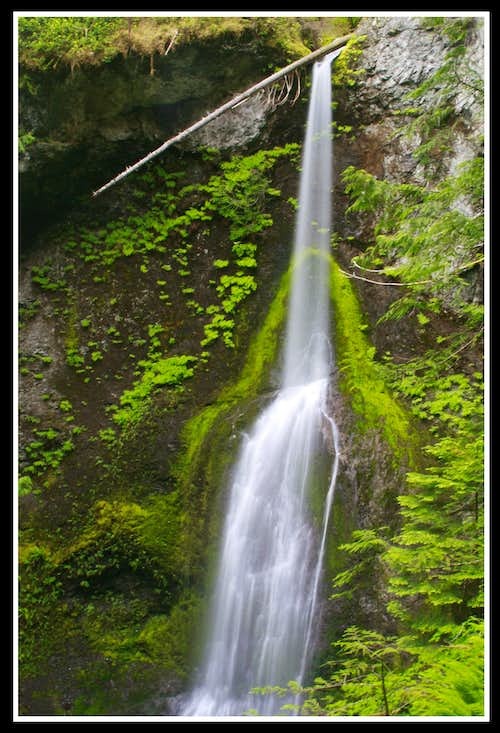 A great short hike to Marymere Falls can be done from the Barnes Point Trail-head. The trail starts by going under the highway and through dense rainforest before coming to a log bridge that crosses Barnes Creek. A series of stairs takes you to a viewpoint of the 100 foot cascade. If you're feeling ambitious you can take the steep Mt. 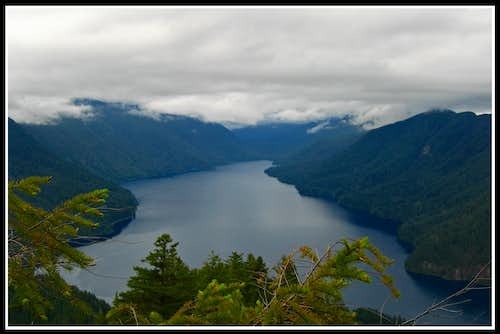 Storm King trail that breaks off the main trail to the falls and climb 3000 feet to a great view of Lake Crescent. There is a very small general store at the west end of the Lake at Fairholm that mainly serves the Fairholm Campground. Don't forget to stop here and walk on the dock. Here a superb view of the entire lake awaits. Taking the dirt road past the Fairholm Campground on the north side of the lake will take you to the trail-head for Pyramid Peak. This peak towers over the lake to the north. There is however a large landslide that took out about 100 feet of the trail and is very dangerous to cross. Since this slide far fewer people have made it to the top of Pyramid Peak. Continuing on Highway 101 up the large hill you will get to a junction with highway 113. Take this road that heads towards Clallam Bay to get to Cape Flattery; the furthest northwestern point in the lower 48. The road turns into highway 112 and follows the Strait of Juan de Fuca for about 25 miles and is windy at times. Upon entering the Makah Nation they ask for you to get a $5 recreation pass good for a year at the general store in Neah Bay. Upon getting your pass they will give you a map. To get to Cape Flattery follow the Cape Loop road until the pavement ends. 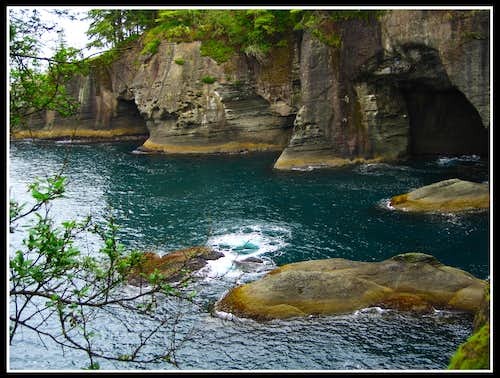 A short half-mile walk takes you to the lands end where the bluffs at Cape Flattery overlook high above the ocean. Tatoosh Island is seen in the distance. A sunny day here is rare but it's very enjoyable no matter what the conditions. Quite possibly the best beach on the Washington coast is now easily accessible thanks to a new trail and trail-head. Drive south passing Hobuck and Sooes beaches (both of these make great places to let your children roam) and park at the small lot marked by the sign. The trail down to Shi Shi beach is always muddy so be prepared for that. It isn't a factor of if you will get muddy but a factor of how muddy you will get. People have placed logs and rocks in the mud pits in the past but they sink. New trails through the trees are being made as people try and go around the pits. This trail is unique because it follows a very old World War 2 road that was constructed so west coast based soldiers can keep an eye out for any Japanese that may be attacking from the west. Hundreds of these kinds of old roads were constructed that are now all overgrown. At the end of the "official" trail you enter Olympic National Park. From this point just head down the steep hill until you get to the beach. The sea stacks are spectacular here and this beach remains the most pristine of all the Washington Beaches...until now. Due to the new trail more people have been coming here and camping here and leaving their trash and traces. Please, if you go here leave no trace. It is recommended you walk the two miles down the beach to the Point of Arches. This is a wonderland of tide-pools, sea stacks, and caves where one can spend hours exploring at low tide. 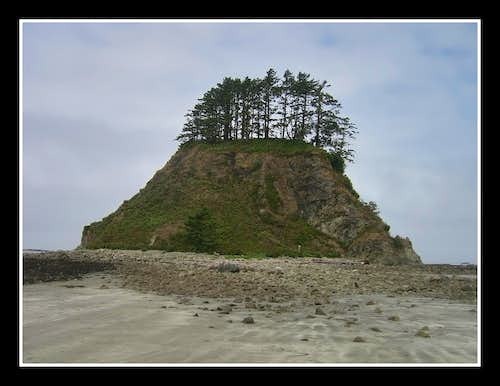 Cape Alava is the westernmost point in the lower 48 and can be accessed via the Lake Ozette trail-head. To get there head on the paved and windy Hoko-Ozette Road which branches south off of Highway 112 near Clallam Bay. The classic hike most people do as a one night backpack or a day hike is knows as the "triangle trail". From the Ozette trail-head one heads northwest towards Cape Alava, then walks south on the beach to Sand Point and then back to the trail-head. The route makes a triangle and is 9 miles long. The trails are mostly on boardwalks and might gain 30 feet of elevation. It's more of a scenic walk. 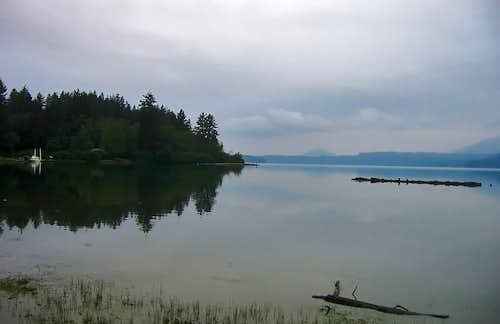 Lake Ozette is a large lake about the same size as Crescent Lake but it's well hidden by trees. The only glimpse you get of it from the road is at the boat launch. Fishing here is popular however the lake lies within the National Park so make sure you have the right passes. Rialto beach is located well south of Cape Alava and has to be accessed by heading back to Highway 101 and getting to Forks. Forks became a world famous virtually overnight thanks to the Twilight series. When I was there I saw fans from all over the country shopping at the Twilight stores that sprang up in the old buildings. Forks has some hotels and stores to allow a resupply if needed. To get to Rialto Beach, take Highway 110 as it goes west off 101 just north of Forks. Keep right on Mora Road and park at the road end. Rialto beach is a mile and a half walk to the famous "Hole-in-the-Wall" which is a large rock wall with a hole in it about 8 feet tall. At low tide, the area can be explored. 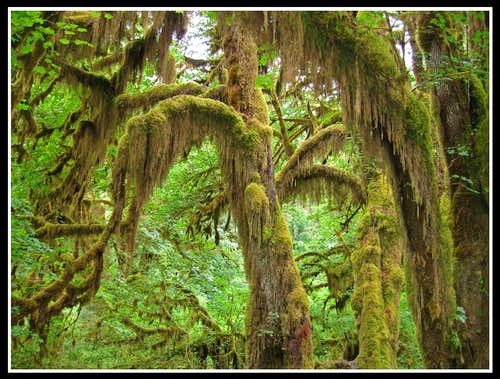 If you wish to see the Hoh Rain forest, turn east onto the Upper Hoh Road from 101 about 12 miles south of Forks. There are numerous nature walks here and this will be the starting point for a climb of Mt. Olympus. Five beaches lie in a row along the coast from north to south separated by headlands. First Beach is located at La Push; a small Indian town that is accessed by continuing on Highway 110 instead of turning on Mora Road. Highway 110 ends at La Push. The Sol Duc and Bogachiel Rivers join rightnear the town of Forks and flow into the ocean just north of La Push and just south of Rialto Beach; which is why there are two roads. This mouth of two rivers is very wide and divides the Washington Coast into the North Beaches and South Beaches. First Beach is the northernmost beach of the South Coast section and Rialto Beach is the southernmost beach in the North Coast section. This is important if one wishes to backpack the entire length of the coastline which I will describe below. A nice day hike however would be to start at First Beach and hike down the beaches and use the overland trails to cross the headlands that separate each beach. As you head south towards Fifth Beach, the number of people gets smaller and smaller. Ruby Beach is named for the distinctive red sand present there. This beach is located just off Highway 101 at the northern extent of its path right next to the beach. A short walk takes you down to a quaint little beach that had some impressive sea stacks. Following Highway 101 south from here will take you on a spectacular 10 mile portion of the highway that follows right next to the beach. About halfway down this part of the road is the busy Kalaloch Beach and campground. This is a small campground and hard to get a spot and reservations can't be made here so plan accordingly. This is probably the most populated beach in the National Park. 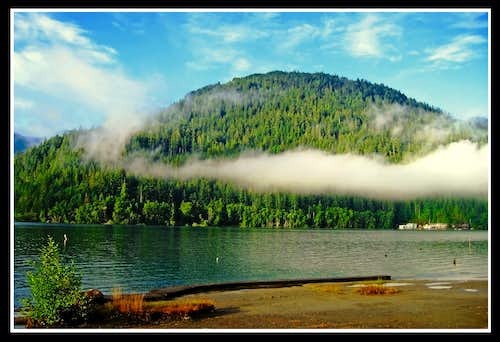 Continuing on Highway 101 brings you to Lake Quinault. There are a few National Park run resorts on this lake and can be a very scenic place for a getaway. 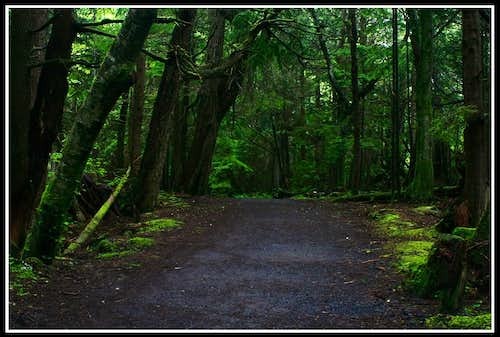 The North and South Shore Roads that lead northeast past Lake Quinault take you well into the Quinault Rain forest and take you to the trail-heads for Graves Creek and the Enchanted Valley. Long summer backpacks are often started here. These two roads follow the Quinault River up the valley towards the interior of the Olympics. Many small waterfalls can be seen along the side of South Shore Road. A bridge connecting South Shore Road and North Shore Road is a great place to turn around if you don't have intentions to hike. The worlds largest Sitka Spruce Tree is along the shore of Lake Quinault. This makes for an interesting sight. For the adventurous, two major backpacks can be done along the coast. The first option takes you along the North Coast section from the Ozette trail-head all the way down to Rialto Beach where the Sol Duc/Bogachiel Rivers drain into the Pacific. Extensive planning must be done to do this as you would either need two cars or a ride. Food must also always be kept in canisters. You must also be prepared to be wet most of the time as there are many small creeks that drain into the ocean that need to be forded. Add to this the fact that it will rain and you have a pretty wet scenario. I hope to do this someday. 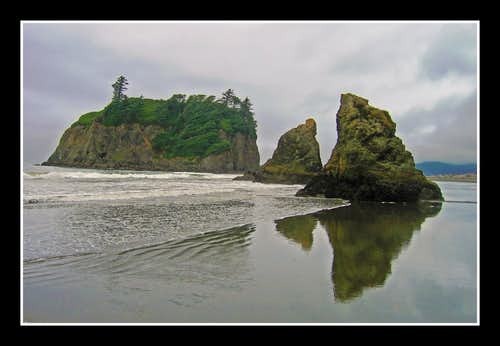 The second option is a little shorter and less torturous takes you along the South Coast Section starting at Third Beach starting from La Push and going down to the mouth of the Hoh River at Oil City. A small trail and parking lot is found at the end of the Oil City Road. These are the trips I would do if I had the time set out to explore Washington's Coast but everything I've mentioned above will also provide memorable experiences for just about anyone. For a ferry schedule from Edmonds to Kindston see this site. 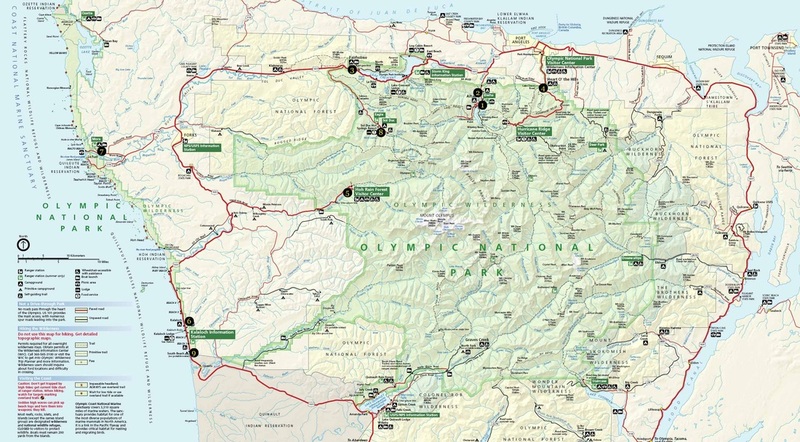 For trail/lodging/road information and just about anything else about Olympic National Park see their website. 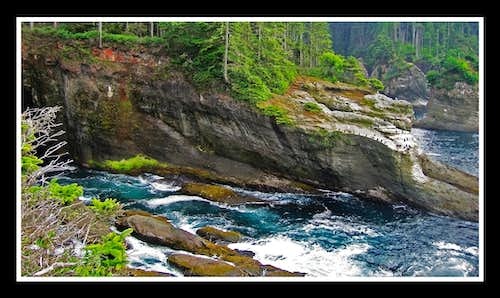 For information about the Makah Nation and Cape Flattery see their website. For a weather forecast at Neah bay see NOAA's site.